They're great when they work, but when they don't, I reckon they must be the greatest source of consternation amongst Wedge owners... but it's not rocket science! The headlamps (bog-standard 7" halogen reflector/ lens units with replaceable bulbs) are mounted in fibreglass pods. The pods hinge on two bolts that screw into captive nuts glassed-in to the shell, each side of the pod recess. Usually the bolt heads are cross-drilled to allow lock-wiring the bolts to prevent them unscrewing themselves. Each pod has its own lift motor, mounted on a steel bracket that, depending on model, year, which way the wind was blowing, is bolted to either the floor of the pod recess or the front wall of the engine bay. If the latter, you can see the screw heads when you open the bonnet. The motor itself is as used on the Triumph TR7, however the bracket is a TVR fabrication. To all intents the motor is a Lucas wiper motor, modified by Lucas for the purpose (it has two 'park' positions instead of just one) and can be serviced in much the same way. The motor is tied to the pod by an operating arm and an adjustable link: again depending on the car, the link can be constructed in a variety of ways but the essence is to allow a degree of adjustment to get the pod flush with the bodyshell when retracted. Be aware that if you alter the link to change the height of the pod when raised, it won't close flush. Firstly, the motors only rotate one way, they do not 'reverse' to make the pods retract once extended. So there is no 'polarity reversal', unlike say, a window lift motor. Each motor has a simple switch and two diodes in the wheelbox. The switch has a common contact and two 'outputs', to each of which are soldered the diodes. The switch contact is a simple copper strip. The common supply terminal is riveted to the strip, this provides one of the potential trouble-spots as the rivet can corrode and lose its connection to the strip. Next in line for grot are the contact pads at each end of the strip. These should be cleaned of corrosion, arcing deposits etc. The two diodes are common silicon rectifiers of the '1N4000' family: if you wander into Maplins (EDIT March 2018 - maybe not for much longer!) or similar and mutter '1N4007' you should come away about 10p poorer but two diodes richer. 1. Lights are off. 12v appears on the Whi/Yel to each pod motor but can go no further as the motor's internal switch is open. 2. Lights are on (Low Beam). A 12v feed appears at one of the two diodes feeding the coil of the Headlamp Motor Control relay. This causes the relay to change over and it applies 12v to each pod motor via the Whi/Purple wires. Passing through one of the motor internal diodes and the closed switch contact, it is fed back to the coil of the Motor relay. The Motor relay changes over and applies 12v to the motor itself, which then starts to lift the pod. Note that the motor's internal switch stays closed during the lift cycle. 3. Is the same as 2. but shows main beam selected instead. 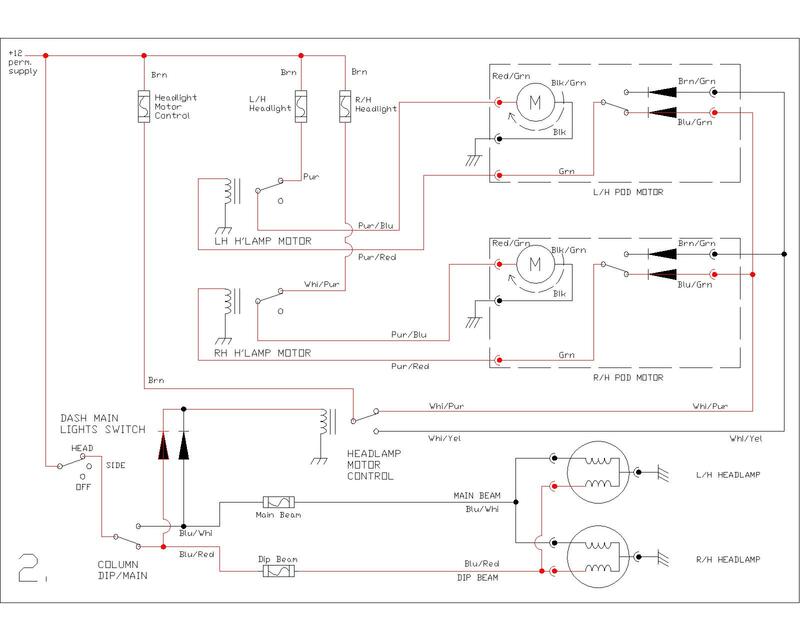 This is why the two diodes feeding the Headlamp Motor Control relay are so important. If either fails the pods won't lift although the lights will be on. 4. The motor has lifted the pod and at this point the internal switch changes over. This breaks the feed to the Motor relay which drops out, disconnecting the pod motor. 5. When the lights are switched off, there is now no 12v at either of the diodes feeding the Headlamp Motor Control relay so it drops out. This reinstates the 12v feed to the Whi/ Yellow wire to each pod motor. Passing through the other internal diode and the switch, the 12v feed is applied to the coil of the Motor relay. Once again the motor fires up and lowers the pod. The motor internal switch again stays closed during the lowering cycle. With the pod retracted the internal switch opens, the Motor relay drops out and the motor stops. This returns the circuit to that shown in 1. Knowing the cycle of operation, it is possible to fault-find on the headlamps fairly rapidly. The presence or absence of either main or dipped beam can be a clue as to whether the pod motors themselves are faulty: a defective ‘Lights’ switch or column dip/main/flash switch can make it appear that the pods are faulty. Simply peering into the headlamp recesses to see if the headlamp bulbs are lit will help here! The pod motors have a knob fitted to the lower end of the armature (rotating shaft), accessible through a hole underneath the car. Very occasionally the holes aren't there! The knob allows you to manually wind the pods up if the electric lift system fails. To gain access to the pod motor it is first necessary to raise the pod, either manually or by turning the lights on. If you put the lights on, it is a good idea to then pull the fuses so you don't flatten the battery. It's also a good idea to pull the pod motor fuse, especially if you have an intermittent fault that may suddenly wind the pod down while your hand is in it! With the pod up, remove the trim from round the headlamp, identify and remove the screws securing the light unit to the pod and carefully extract the light, disconnecting the wiring loom connector once accessible. Either disconnect the link from the pod or from the lift motor (I usually just remove the nut from the motor shaft), remove the lockwires and unscrew the pod pivot bolts to allow removal of the pod. The motor can then be unscrewed from its mounting and unplugged from the loom before removal to a bench - or the bin, if it's really bad! Fortunately the new installation DOES give an improvement - a bloody good one too! The dipped beam seems only marginally better but I suspect that's down to the lens design and resultant light pattern: modern cars seem to give a wider spread of light where these throw two nice bright pools... but only a few feet in front of the car! The main beam is much better though, and an odd spin-off is that the reduced load on the wiring inside the cabin has given the audio system a much-needed boost in the sense that it no longer cuts out due to voltage drop when the lights are on!